As white supremacist anti-immigrant hate groups increase their targeting of New Haven and adjacent East Haven, a dialogue was held this week addressing the need for unity of workers of all racial and national backgrounds. The historical background presented by Dr. Kenneth Brown, diversity training consultant from Maryland, led to a lively and productive exchange with the audience. The meeting, organized by the Center for New Community, was held in the historic African American Dixwell neighborhood at Beulah Heights First Pentecostal Church and was welcomed by Bishop Theodore Brooks. 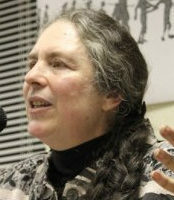 Brown expanded on the history of racism in our nation, built on slavery and on the exploitation of immigrants, and gave examples of how unity against racism has led to social progress. Recalling how the Irish and then the Italians were victims of super exploitation and were pitted against one another and against African Americans when they first came to the United States, he said they soon discovered that they had to get together in order to improve their conditions. Brown gave the example of the early years of the auto workers union in Detroit when Henry Ford hired African American workers from the South as strike breakers. But when African American and white workers united in the UAW, “Ford lost his juice,” said Brown. Today, exploited Mexican immigrants are picking apples in Michigan, said Brown, pointing out that while they must pay into Social Security, they can never collect. Referring to US trade policy, he asked the audience to consider why Latin America is in poverty conditions which are driving people to this country to survive. “Why are we talking about hard working immigrants ‘taking our jobs?’” he asked the audience. Alan Felder, a member of the service and maintenance union at Yale University, Local 35, and an independent plumber, said immigrants have most of the jobs in construction. When asked if Black workers had those jobs before, the answer was no. New Haven needs to talk about how to get contractors to not exploit anyone, said Brown, adding that until the entire community gets together to fight exploitation, the contractor will just enjoy himself out on his yacht. The issue, said Brown, is that there should be jobs for everyone in New Haven. Felder has made a name for himself as an African American who joined with the anti-immigrant Community Watch Dog Project to protest the municipal ID card issued in New Haven to allow everyone who lives in the city, regardless of status, a photo ID for business and public services. While saying he learned a lot at the meeting, he continued to maintain an “enforcement first” approach to undocumented workers. A number of Felder’s co-workers from Local 35, also at the meeting, expressed appreciation for the methodical and common sense approach presented by Brown. Local 35 has been a strong voice for immigrant rights and for workers unity in New Haven. At the end of the meeting Brown walked to a group of Latino immigrants and asked each one to tell their story. “Wouldn’t you want to know such hard working fine people?” he said to everyone in the church. The dialogue was organized by Brown’s son, Ken Brown Jr., who moved to New Haven several months ago to work on building unity—among African Americans, immigrants and all segments of the community—against anti-immigrant hate. He thanked his father profusely and left the meeting with the challenge to continue the process of coming together.